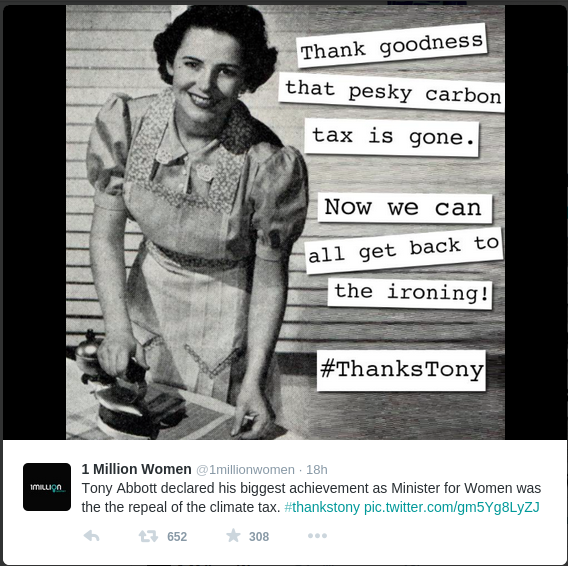 What a world we live in where we face major impacts on human civilisation from climate change and environmental degradation and Australia's Prime Minister and self appointed Minister for Women Tony Abbott identifies the abolition of the carbon tax as his greatest achievement in 2014 for women in Australia. The comments were made in an interview on the Today show when speaking about the recent cabinet reshuffle. The cabinet reshuffle doubled the representation of women in cabinet to two. "Well, you know, it is very important to do the right thing by families and households. As many of us know, women are particularly focused on the household budget and the repeal of the carbon tax means a $550 a year benefit for the average family." Abbott also promised his paid parental leave scheme would also be introduced to parliament in 2015, although it has it's detractors in the Liberal Party Room and is heavily criticised by Labor, the Greens and cross-bench senators and unlikely to pass. Abbott's comments brought swift reaction in responses on social media with the hastags of #thankstony and #burntheironing, and PutYourIronOut being popular. Amy Stockwell, in an opinion article on Mammamia, said "It's time for the Minister For Women to resign." and listing a myriad of critical issues for women that are not being adequately addressed by this government. Here is how the UK Independent reported the story. Here is how Ari Phillips wrote up the story in the US for Climate Progress website. In the ministerial reshuffle Sussan Ley has been elevated to Cabinet and been named as Health Minister and Minister for Sport. This still makes Australia a lower representation in Government than the Government's of Afghanistan and Iraq. Two other women were elevated to the front bench in support roles in the outer ministry. Kelly O'Dwyer will take on the role of Parliamentary Secretary to the Treasurer. Karen Andrews, a former engineer, will take on the role of Parliamentary Secretary to the newly retitled Minister for Industry and Science, Ian McFarlane. Just to take you back two years to 2012 and Prime Minister Julia Gillard's misogyny speech on Tony Abbott. 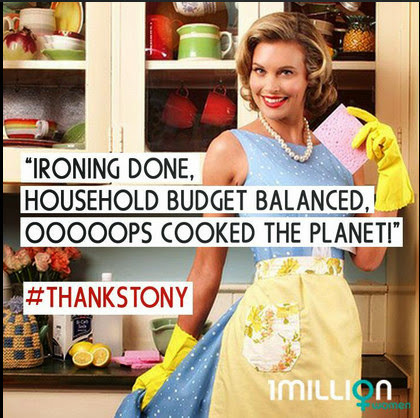 Well, Tony Abbott has continued denigrating the women of Australia. Of course women are also dependent on social services through Family allowances and benefits and Abbott has moved Scott Morrison to Minister for Social Services. In Immigration Morrison presided over a cruel and inhumane policy of offshore detention of asylum seekers and refugees. A decision announced on Monday, under the previous Minister Kevin Andrews, resulted in Social Services scrapping funding for homeless and housing groups on December 21. What a wonderful Christmas present this must be for these programs to hear. As part of the reshuffle Science has made a return, at least in name, to the ministry with Industry Minister Ian McFarlane assuming the title of Minister for Industry and Science. But don't worry too much about the Environment Ministry becoming too uppity under Geg Hunt as the Hon Bob Baldwin MP (patterson electorate) will become Parliamentary Secretary to the Minister for the Environment and provide a strong focus on the Green Army programme. "On climate change, I am neither a sceptic nor a denier. I have read widely and talked to scientists, but I am not a scientist. Maybe climate change is cyclic? I do not know, because there are too many subjective opinions in this argument, each proffering a different expert perspective. In August it was revealed in ICAC proceedings that Baldwin strongly urged the NSW Coalition Government in 2011 to support Nathan Tinkler's Buildev coal loader project. Counsel assisting the ICAC Geoffrey Watson described Mr Baldwin as "really spruiking the case" and "in effect [giving] Buildev a right to review the terms of his letter", according to a report in the Newcastle Herald. Baldwin has a history of climate denial as clearly ennunciated in a speech in China in 2010 at the APEC SME summit, and in parliament, all clearly outlined in this report by Giles Parkinson at Renew Economy: Tony Abbott appoints climate skeptic to “help” on environment.